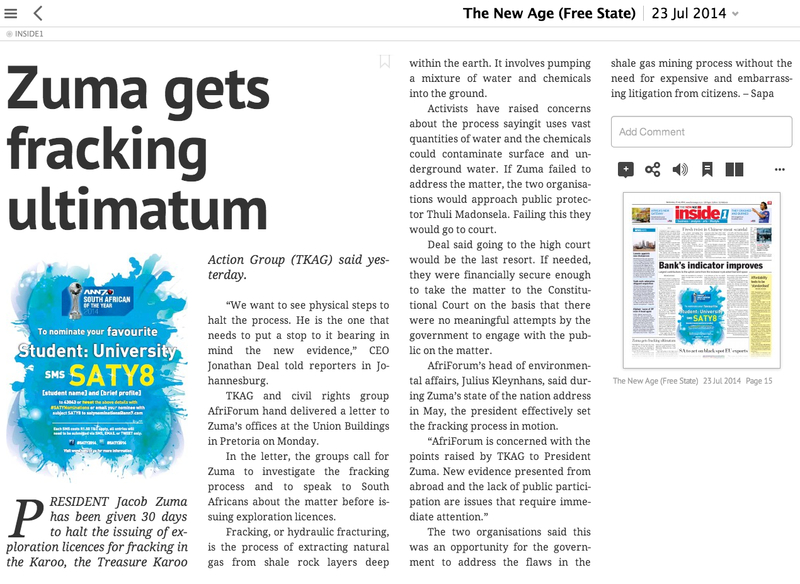 Anti-fracking lobby group Treasure the Karoo Action Group (TKAG) and social rights group AfriForum hand delivered a letter to President Jacob Zuma this week calling on him to declare a fresh moratorium on hydraulic fracturing in South Africa, or face possible legal action. TKAG CEO Jonathan Deal reported on Tuesday that the letter questioned government’s apparent willingness to proceed with the processing of exploration applications despite having failed to address several outstanding concerns that had been raised by fracking opponents over the past three-and-a-half years. In his State of the Nation address on June 17, Zuma described shale energy as a “game changer” and said that the “the shale-gas option” would be pursued “within the framework of our good environmental laws”. Subsequently, Shell’s Bonang Mohale urged government to accelerate the licensing process, warning that South Africa ran the risk of missing out on the shale-gas boom as it had with the commodity boom. Untested estimates indicated that South Africa could have more than 300-trillion cubic feet of shale gas in the Karoo basin, which proponents believe should be exploited to help the country diversify its coal-heavy electricity mix and even, potentially, to produce transport fuels. However, Deal said the alliance against fracking – which was led by TKAG and AfriForum, but also embraced civil society, labour and religious groups – felt there were at least five outstanding issues that had to be address before South Africa could consider proceeding. The first, and most important, related to public consultation, which AfriForum’s head of environmental affairs Julius Kleynhans argued had been entirely inadequate to date. 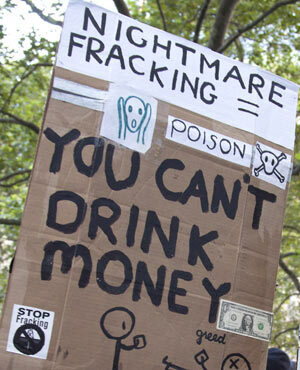 However, the draft fracking regulations outlined in 2013 were also said to be “flawed”, with no indication yet given as to whether the final regulations would take account of public submissions – the alliance against fracking’s own submission ran to over 300 pages. Thirdly, concerns lingered over the composition of the task team assembled by the Department of Mineral Resources to finalise the framework under which shale-gas exploration and development could proceed. Deal argued that a new task team should be assembled that included individuals who were more critical of fracking and its potential benefits. Opponents also had serious misgivings about the quality of the environmental management plans that had been submitted by potential shale-gas miners. They also felt that the precautionary principle should remain in place until outstanding scientific questions were adequately answered. There was a “golden opportunity”, Deal argued, for government to restart the consultation process, the length of the previous consultation should not be confused with a credible process. Deal said he had been heartened by Mineral Resources Minister Ngoako Ramatlhodi’s indication that he was willing to engage with the TKAG. However, neither he nor Kleynhans had received a formal approach from the Minister. The alliance, which signed off its letter to Zuma with the words “in good faith”, said it hoped to receive a positive response from government to its “non-litigious” overture within the coming 30 days. Should no response emerge, however, preparations would be made to take “legal steps”, the first of which was likely to be triggered should government grant an exploration licence to any of the current applicants. Kleynhans indicated that AfriForum already had the financial wherewithal to take the matter legal and that it was convinced that there would be others willing to join the alliance in what threatened to become an expensive and drawn out legal battle. “Our letter presents government with a valuable opportunity to address fatal flaws in its approach to shale-gas mining without the need for enormously expensive and embarrassing litigation from the citizens of South Africa,” Deal said. But he likened the current approach to agreeing to “get on a plane where we don’t even know if the pilot has a licence, or if the plane has been serviced”. “This is not about bunny hugging and we wouldn’t have the effrontery to talk about stars and birds and bees and rabbits when this country needs energy and it needs employment,” Deal stressed, adding that the debate needed to centre on economics and the science. Deal also embraced the Economic Freedom Fighters (EFF) recent opposition to fracking, which drew a wry smile from Kleynhans, who admitted that AfriForum, which is known for fighting for minority Afrikaner rights, was not currently on speaking terms with JuliusMalema’s party. Deal was more enthusiastic about the EFF’s potential involvement saying: “I’m not a political animal at all and I’ve had to learn politics fairly quickly in the last three-and-a-half years. But one thing I would say for Julius Malema is that, if he has an opinion, he’s not scared to make it known and not scared to stand up for it – and I admire that in him”.